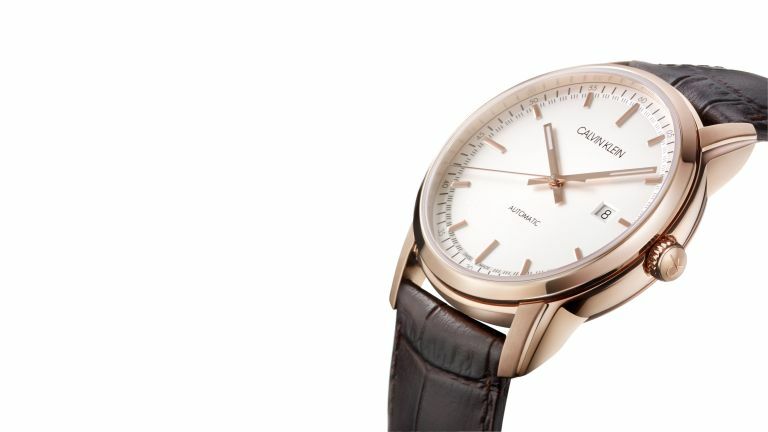 If you're looking for a stylish watch which will also earn you some horological kudos, Calvin Klein's new Infinite Too is a great place to start. It's an incredibly attractive piece with an automatic movement, and, best of all, it's available for under £500. Let's start with the case, which would look great dressed up or down. It measures 42mm, and we think it's ideally suited to a date, showing you've got taste and style, but aren't too flashy. The handsome case houses an ETA 2824-2 movement, which is often used by much more expensive brands such as TAG Heuer and Breitling. It's an automatic movement, which means it's powered by the the movement of your wrist, rather than a battery. The transparent case back allows you to glimpse the movement in action. The Infinite Too features sapphire glass and either a stainless steel or pink gold PVD case. It's finished with either a black or brown embossed leather strap, or stainless steel bracelet. You can choose between a silver, black or blue dial, each featuring the “Calvin Klein” logo at 12 o’clock. Prices for the Calvin Klein Infinite Too start at £419, you check out the full range on the brand's website.